The OrthoWrap® Bioresorbable Sheet can be utilized for the management and protection of tendon injuries where there has been no substantial loss of tendon tissue. 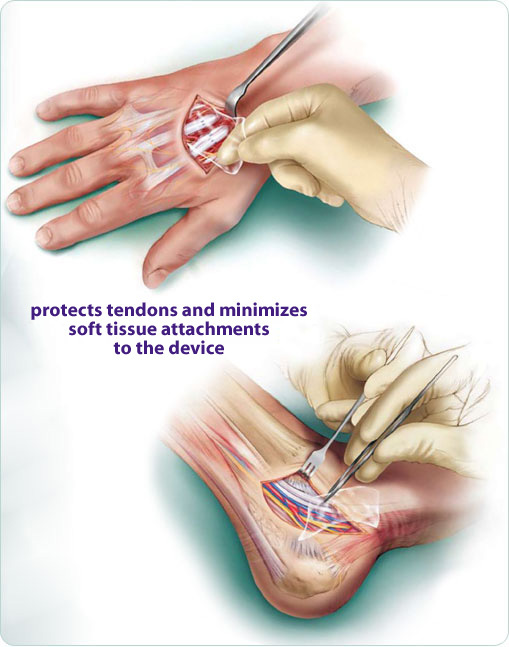 The bioresorbable sheet minimizes soft tissue attachments to the device when in contact with other tissues. OrthoWrap® is a sheet made from an amorphous bioresorbable copolymer 70:30 Poly(L-lactide-co-D,L-lactide) commonly referred to as PLA. PLA has no known side effects with minimal risk of inflammatory reaction. The non-porous hydrophobic nature of the material is known to resist attachments. PLA and similar bioresorabable materials have been used in surgical implants and suture materials for over thirty years. Virtually weightless bioresorbable protective sheet is clear and allows for complete visualization of all anatomy for ease of placement. OrthoWrap® is easily repositioned in wet environments, can be sutured into place for complete surgeon control, and can easily be trimmed and cut for specific anatomical considerations. OrthoWrap® is impermeable throughout the critical healing period and up to 8 weeks.